BANGKOK, May 17, 2010 (AFP) - A renegade Thai general who became an unofficial military advisor to the thousands of anti-government protesters occupying central Bangkok, died Monday of a head wound sustained last week. Major-General Khattiya Sawasdipol, 58, better known by his non-de-guerre Seh Daeng, or "Commander Red", died in hospital four days after being shot in the head at the sprawling anti-government protester camp. He had been in intensive care since being shot while giving an interview to a foreign reporter at the fortified base and deteriorated Sunday, medics said. While the army denied shooting the outspoken general, it had warned it would deploy snipers in the area as part of efforts to end two months of protests that have turned swathes of the capital into no-go zones. It remained unclear who shot him. Prime Minister Abhisit Vejjajiva this month accused Seh Daeng of prolonging the street demonstrations and the rogue general made no secret of the fact he opposed any reconciliation deal with the government. "It's important that I'm here. Everyone is here because Seh Daeng is here," he told AFP in an interview just a day before he was shot. Seh Daeng was surrounded by knots of fans seeking his autograph and photo whenever he walked through the rally site. Vendors at the camp displayed best-selling books about the supposed jungle warfare adventures that turned him into a Thai legend. Seh Daeng was loyal to the Red Shirts' hero, former prime minister Thaksin Shinawatra who was unseated in a 2006 coup, and even visited him in his self-imposed exile. The general was suspended from duty in January and faced dismissal from the Thai army after a panel found him guilty of military crimes. He traced his fallout with commanders to 2008 when he publicly criticised the head of the army and was reassigned to lead aerobics classes at a local market. "Everybody laughed at me. You don't assign a warrior like me to do a stupid thing like that," Seh Daeng said. "Do you know the 'Braveheart' movie? Mel Gibson is the same as me," he said, equating himself to the kilted onscreen figure who was betrayed by the Scottish aristocracy. Seh Daeng had a reputation for making bizarre statements, but many saw his hardline role in the protests as a sign that the political crisis, which has now left a total of 66 dead and about 1,700 wounded, could get more violent. After his shooting, it did. 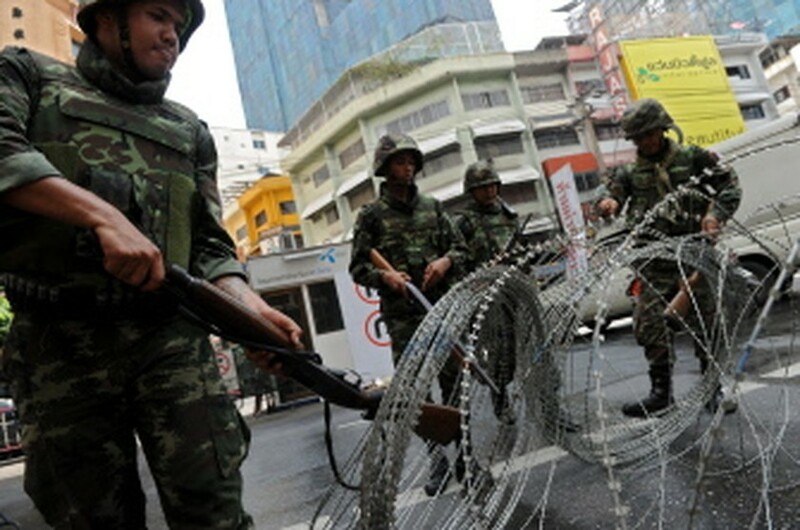 Thai troops and the Reds have fought street battles on the fringes of the protesters' encampment since late last week. Authorities accused Seh Daeng of having a hand in dozens of unsolved grenade attacks in Bangkok, while others alleged he trained mysterious black-clad gunmen who fired at troops during street clashes. The general denied any involvement in the violence, saying he concentrated on inspecting the barricades of fuel-soaked tyres, bamboo poles and razor wire that he designed and erected at the Reds' base. An agreement to fold up the encampment looked imminent early this month when the Reds initially accepted a proposal for November elections, but efforts to reach a deal that would see them go home subsequently broke down. Core Red leaders also publicly distanced themselves from Seh Daeng as protests became increasingly violent -- and he treated the movement's leaders with contempt. "The Red Shirt leaders themselves are cheating. They're doing it for themselves. They're not doing it for the people who come to rally," he said.